Improving facilities: Low-cost flats need to be spruced up to make it more liveable. The state government has given priority to improving the quality of life of residents at low-cost apartments through its Caring Government for Residents’ Improvement Aid (Ceria) scheme. Under the scheme, the state will repair lifts, roofing and water tanks at the flats as well as other issues. Housing, Building Structure Administration and Squatters committee chairman Iskandar Abdul Samad said the state had agreed to share 80% of the cost and the buyers 20% for repairs at the low-cost apartments. “This way, the apartment buyers will have a sense of belonging to the facilities in their buildings. “This also enables the buyers to know the cost of maintenance and how much the Government is paying for it,” he said. Iskandar added that the Ceria scheme started in June last year and the state had spent RM9.1mil so far. 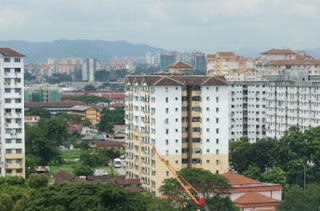 “Last year, the state contributed RM5.1mil while the buyers paid RM1.8mil. “The problems in the low-cost apartments are leaking roofs, lift breakdown, rusting water tanks, broken fencing, clogged drains, potholed roads, rundown playgrounds and sewage. “In the state executive council meeting on Oct 27 in 2010, it was decided there will be a 20% increase in parking bays at low-cost housing projects to address the shortage at such schemes,” said Iskandar when answering a question from Haniza Mohamed Talha (PR-Taman Medan) on the state’s plan for housing for former squatters and the strategy to solve issues like of parking bay shortage.